Fall is officially my favorite time of year. And while the changing trees and falling leaves are among the season's most favorable sights, I always look forward to the cooler weather and the clothing options that accompany it. Below are a few of the things I am most excited about for fall. 1. Seychelles True Story Riding Boots: Own them in cognac (pictured) and black. I finally broke down and purchased these after several seasons of investing in lesser quality boots, only to watch the lesser quality ones peel, scuff and wimp out by spring. So, these were a splurge last winter that I am hoping they will last a long time. They are, by far, my most favorite article of clothing. The black ones are a success story in their own right. I scored them on some random website that I wasn't even sure was a real website until they arrived on my door step. I'm still not completely sure it was a real place, but real enough that they marked these babies down to an unbelievable dream-come-true price, of way less than half. More like 1/5 of what they are currently running anywhere, so you know what I had to do. Hey - There were no other options. Don't judge me. I have a problem with boots and I have admitted it so I am already past the first stage of getting help. 2. Scarf. Or in this case, a Snood. I guess that's a new term I know nothing about. Personally, I like to call them "scoobs" half scarf -half tube. But whatever. I like this one and I like wearing scarfs/snoods/scoobs in the fall and winter and usually opt for one with a jacket as opposed to a winter coat. This one is a great color and available from TopShop. 3. Jacket. Dream of it. The layered look has to be my favorite. I would take cooler weather over warmer weather any day. This jacket is super cute and available from one of the stores I dream of on the regular, Anthropologie. I've been on a yellow kick lately, not sure what that is all about, but I like this in yellow. Would be super cute in red though too. 4. Stocking Cap. Really like this little pumpkin. Also found at TopShop. 5. Black & white stripes. Love the combo. Own varieties of it. This sweater available at Nordstrom. but I love any combination of the striped duo on just about anything. 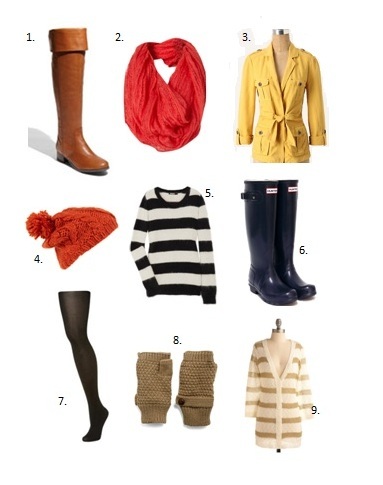 Add skinny jeans and the boots = my favorite look for fall. 6. Hunter Wellies. Own these in black; dream of these in every color. I love rain. I love wellies. You can find these where I got mine, shoes.com, or pretty much anywhere shoes are sold. 7. Black tights. Love them. Wear any dress with a pair and its an instant outfit for colder days. Add a cardigan and boots and you're good to go! 8. Finger-less gloves. Love. I'm not big on gloves, even though my dry hands wish I were, but these are the perfect compromise. Found at ModCloth. 9. Cardigans. Love. With stripes? -- yes please! Also from ModCloth. So many cute options for dressing for the season. Just wanted to share a few of my faves.